Have you ever wondered how old you are in horse years? Or, have you wondered how old your horse is in human years? There are no hard and fast equivalents. Horses and humans age and mature at different rates. So all comparisons are only estimates and shouldn't be taken too seriously. Research completed in 2003 by equine veterinarians has compared the stages of human ages to horse ages. The chart below is based on that research as published by Equine Resources International. It's important to remember that many things affect aging like basic care, size, genetics, and overall health, just as in humans. For example, ponies mature faster but live longer than larger horses. Some age record breakers have been ponies. Poor health will shorten a horse's life and may delay or damage its physical development. Nutrition and workload play a huge role in equine aging. This makes it very difficult to make an accurate match between horse and human age. This is only one of the several charts that try to map out horse-to-human age comparisons. Horse Years Methodology from WOW Horses has a table that compares human to horse development for the horse's first four years. Horses mature much faster than humans do. Horses may be more likely to die from a disease or colic than of old age. On the chart you see here, under the age of one year old, there is no comparison. A human infant may take over a year to learn to walk, but a horse will walk within an hour after birth. 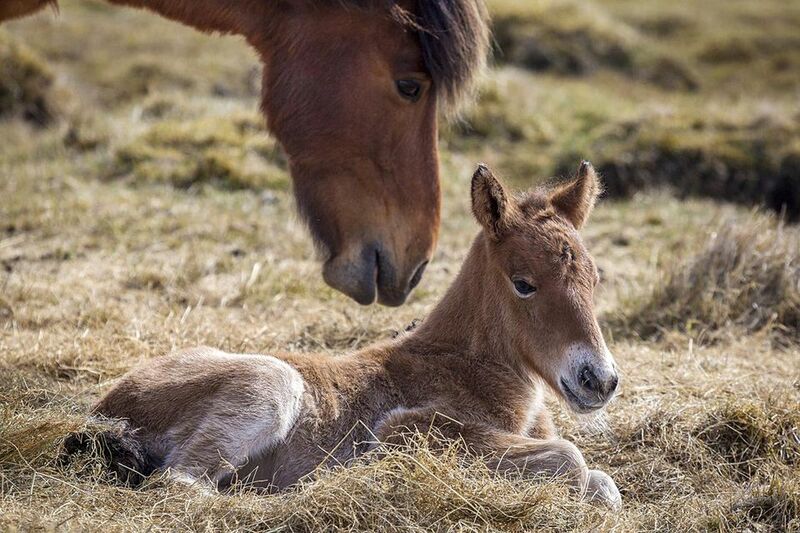 Human infants may start eating solid food at about six months, but foals will start imitating their mothers and nibble on grass within weeks or even days after birth. Overall, all aspects of growth are much faster for a horse than a human. And although the chart suggests that a yearling horse is equivalent to a six-year-old child, that is only very approximate as a six-year-old child won't be able to feed itself or otherwise interact socially and look after itself like a yearling horse. Horse are independent as soon as they are weaned from their mother's milk. Not so with humans who need several years of nurturing before they are truly adults able to live on their own. It will be a long time before a child can provide itself with all the nutrition it needs, especially if you consider that human food must be hunted, gathered or grown. Nevertheless, it is fun to compare your horse's age to a human, keeping in mind that the comparisons on this, or any chart, are not 100% accurate. So when you look at this chart, remember that it isn't easy to make a comparison between you and your horse when it comes to aging. Human and horse development and lifespan is quite different. Here's the Right Way to Use the Word "Colt"